Kids at home for Christmas holiday...hoorayyyyyy don't need to set up an early alarm for 3 weeks ! don't get so excited, lots of thinking and preparation, beginning of cooking different meals and snacks in the kitchen. It's been ages that I've bought any shop bought snacks for my kids, always prefer to make at home. So this year no different. Few days back I asked family let me know what do you want to eat during holiday, so I can stock up needed ingredients. Everyone agreed on healthy meals and snacks and one or two treats for Christmas. While we were making a list of snacks, hubby reminded me Oats Chewdo, which I prepared when we went on a holiday to Portugal in May. I totally forgot to post earlier here, although I took pictures of it that time. So prepared once more and posting recipe too. Well, better late than never ! Oats chewdo healthy treat for young and old. I did not deep fry the oats, just roasted in a little oil. So not crunchy as much as the Cornflakes or Sprouted Beans and Cornflakes chewdo but still the taste remains marvellous ! Little tangy, sweet and spicy , A super tasty anytime snack ready in jiffy ! Roast cashews and peanuts in a pan till nice and crunchy. Now roast oats with one tbsp. oil in a heavy based pan till light golden on a low heat. Add roasted nuts, raisins, sugar, salt, red chilli and turmeric powder and citric acid and mix well. Heat remaining oil in a small pan, add cloves and cinnamon and fry for few seconds, remove from the oil and add into oats bowl. In remaining hot oil add curry leaves and fry till little crispier, remove and add in to the cereal bowl. In same oil add green chillies and fry till they are crispy and add sesame seeds ( be careful chilli seeds might pop out ) pour oil, chillies and sesame seeds in to the oats mixture. Gently give it a good mix with your hands, so all the spices and sugar coats over the oats really well . Check the seasoning, adjust the taste. Mixture should be tangy, sweet and spicy. 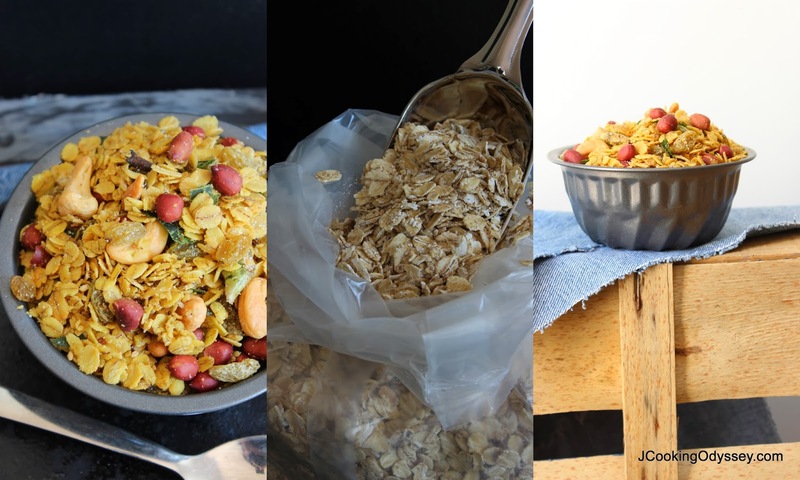 When the cereal mixtures cool down transfer into a air tight container. Best to finish in one week. Really delicious Jag and healthy too. It came out really well! Thanks a lot for the healthy recipe!! I had a small question regarding the salt -- no matter how much salt I added it didn't seem to get the mixture to taste like it had enough salt. Any tips to keep in mind while adding the salt? Thanks! Hi Hanna, Thank you for trying out this recipe, it's so tasty isn't it ? Regarding salt, add salt as soon as you roast them and while they are warm so salt sticks to the oats. Hope this helps, let me know. 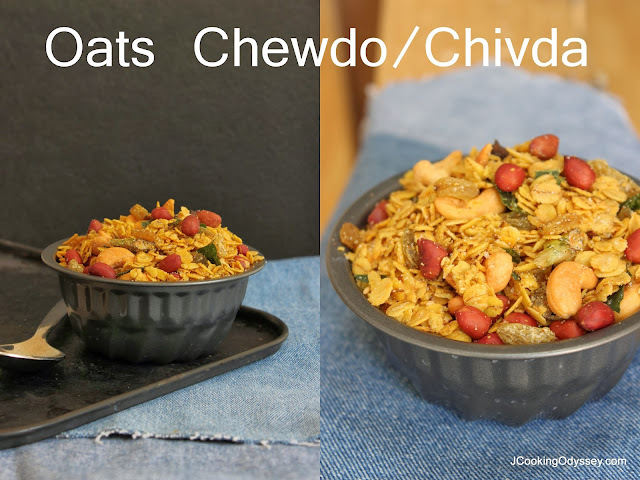 I am the worst chivda maker ever but will like to try this chivda. So healthy n delicious.